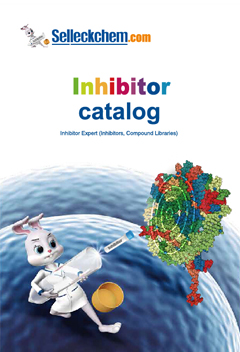 Ridaforolimus (Deforolimus, MK-8669) is a selective mTOR inhibitor with IC50 of 0.2 nM in HT-1080 cell line; while not classified as a prodrug, mTOR inhibition and FKBP12 binding is similar to rapamycin. Phase 3. Protein analysis of ARK1 and ARK2 (A) xenografts following acute therapy with vehicle, ridaforolimus, lapatinib and trastuzumab or the triple combination. Gynecol Oncol, 2016, 141(3):570-9. Ridaforolimus (Deforolimus, MK-8669) purchased from Selleck. Breast cancer cells were pretreated with 100ng/ml EGF for 15 min and then treated with the indicated concentrations of Deforolimus for 24 hours. Dr. Zhang of Tianjin Medical University. Ridaforolimus (Deforolimus, MK-8669) purchased from Selleck. HT-1080 cells are treated with increasing concentrations of Deforolimus (0-100 nM) for 2 hours, prior to harvest. Cellular lysates are extracted in denaturing lysis buffer, resolved on SDS-PAGE and transferred to PVDF membranes. After blocking, membranes are incubated with primary antibodies for 1 hour, followed by appropriate HRPconjugated secondary antibodies for 1 hour at room temperature. Immunoreactive proteins are detected using enhanced chemiluminescence and autoradiography performed by exposure to X-ray film. 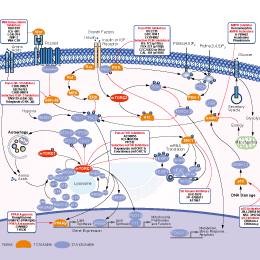 IC50 is determined from the inhibition of levels of phosphorylated ribosomal protein S6 (p-S6) and 4E-BP1 (p-4E-BP1). Method: Cells are seeded at 2-3 × 104/mL, and serial dilutions of Deforolimus are added after 2 hours, for at least three cell doublings (72-120 hours). Deforolimus effects are measured using the CellTiter 96 Aqueous nonradioactive cell proliferation assay and Sulforhodamine B assays. For Deforolimus, growth effects are described as IC30 because rapamycin and its derivatives do not significantly impede cell proliferation. Rivera VM, et al. Mol Cancer Ther, 2011, 10(6), 1059-1071. Legrier ME, et al. Cancer Res, 2007, 67(23), 11300-11308. Gayle SS, et al. Anticancer Agents Med Chem, 2012, 12(2), 151-162. Squillace RM, et al. Int J Oncol, 2012, 41(2), 425-432. Floc'h N, et al. Cancer Res, 2012, 72(17), 4483-4493. KU-0063794 : mTORC1 and mTORC2, IC50=~10 nM.